Peill Crystal, Hand Blown Claret Wine Glasses, 2 pieces per lot. Pattern: CORA. Style: Mid Century Modern, MCM. Model: Claret Wine Glass. Color: Smoke Bowl, Clear Stem. Triple wrapped and double boxed for safe arrival. Beautiful 8" Crystal bowl by Peill Bleikristall - Germany. Heavy (over 3 lb.). and thick (1/4") crystal. at top, and 6" dia. This features a clear crystal with a slightly flared rim. There is gold trim around the rim and the bowl is footed. This piece is smooth throughout and has the Peill and Putzlermark on the foot. I have provided a lot of pictures to best describe the condition of this bowl. This set of 11 wine glasses were made by Peill & Putzler of Germany. They hold about 4-5 ounces. Each glass has a cut floral and lattice design on the bowl. They are excellent quality crystal. There is light surface wear. This is for a set of 2 Peill Granada4 3/8" x 2 1/2" Flat Tumblers 8 oz. This set of 8 crystal water goblets were made by Peill & Putzler of Germany. They hold about 6-7 ounces. Each glass has a cut floral and lattice design on the bowl. They are excellent quality crystal. This pattern consists of cut panels on the bowl and a multi-sided stem. They would make a great addition to your collection. Acid etched mark on bottom - very difficult to get in picture but circled the photo where mark is. An absolute beautiful piece! Previously used Peill Wine glasses 4 1/8” tall with square base. Signed with a P on the bottom. Not very tall at a little over 4 inches. No chips, cracks but I did notice a small rubbed place on the bowl of one that looks like a tiny smudge. I personally would use them as sherry or cordial glasses, but they are Wine. I list it because these are SO rare I can't imagine donating it and having it get broken. If you have this pattern--Alexa--by Piell & Putlzer from 1979, this is a great find. Sorry for the pic of a grouping--I only have one. FOR SALE, A PEILL CRYSTAL CLARET WINE GOBLET IN THE DOMINO PATTERN. Nice quality crystal. Trademark on bottom. I didn't know this maker, but I keep feeling like is was good quality and just had to be signed, and last night I finally saw the very faint mark on the bottom. Please Look At ALL The Pictures. 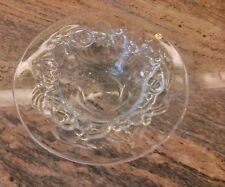 Gorgeous Crystal bowl in excellent unused Condition. One has a chip shown in last pic. marked with the P on base. Pattern Atlantis. Material Crystal. Condition Excellent. Great, nearly new condition. May have one or two small knife marks, or a tiny bit of trim wear (if applicable). You really have to look hard to see any wear on this china. SIGNED BY PEILL & PUTZLER. The inventory of china, crystal and flatware we list changes. 2 of the large glasses still have sticker. 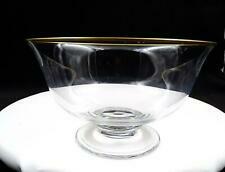 PEILL MERCATOR GERMAN GLASS 8 CHAMPAGNE SHERBET 4 7/8"
Pattern Iris. Material Crystal. Condition Excellent. Notes EXCELLENT: Great, nearly new condition. May have one or two marks, or a tiny bit of wear. Great, nearly new condition. May have one or two scratches, or a tiny bit of trim wear (if applicable). PEILL MARCATOR GERMAN GLASS 3 WATER GLASSES 6 1/8"
The Peill & Putzler acid-etched mark is on the bottom of the glass. NOTE: I have a total of SIX of these glass available - five in very good condition and listed here and one with a tiny smooth chip on the inner rim. In 1903, Leopold Peill (1872-1941) founded Peill & Söhn glassworks in Düren, specializing in cut glass for tableware. At its height the factory was the largest employer in Düren with 1,500 workers. His sinuous and minimalist designs are still associated with the firm. Pattern Atlantis. Material Crystal. A condition of "Good" will be followed by a brief note of what the defects are. Condition Excellent. Great, nearly new condition. May have one or two small knife marks, or a tiny bit of trim wear (if applicable). Pattern 921. Material Crystal. A condition of "Good" will be followed by a brief note of what the defects are. Condition Excellent. Great, nearly new condition. May have one or two scratches, or a tiny bit of trim wear (if applicable). PEILL crystal PFALZGRAF pattern Wine Goblet 5-3/4"
PEILL crystal PFALZGRAF pattern Liquor Cocktail 3 7/8"
The wine glasses are 6" tall and hold 4 oz. FROM ESTATE SALE.IN EXCELLENT CONDITION. ABSOLUTE GORGEOUS. WONDERFUL SOUND AND REFLECTIONS IN THE LIGHT. VERY ORNATED DESIGN. THIS IS PART OF A PEILL COLLECTION. The crystal rock cut facets on the outside of the bowl are inspired by natural rock formations. PEILL crystal PFALZGRAF pattern Sherry Glass or Goblet 4 5/8"
BEAUTIFUL CHAMPAGNE / TALL SHERBET. MADE BY PEILL CRYSTAL. THE PATTERN IS ALEXA GOLD - #079. WAFER STEM, PLAIN BOWL, GOLD TRIM. Peill manufacturers of artisan crystal from 1903-2004. GOBLET 7.25" TALL 24% lead Crystal. 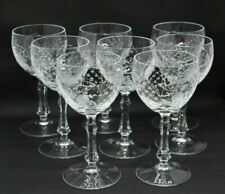 GRANADAPEILL CRYSTAL STEMWARE. NEW NEVER USED IN ORIGINAL BOX. PEILL CRYSTAL GIFTWARE. Peill manufacturers of artisan crystal from 1903-2004. NAPOLI ROSE BOWL#25370. NEW NEVER USED IN ORIGINAL BOX. PEILL CRYSTAL STEMWARE. Peill manufacturers of artisan crystal from 1903-2004. OLD FASHIONED #10513. NEW NEVER USED IN ORIGINAL BOX. PEILL CRYSTAL GIFTWARE. BOWL #29785. Peill manufacturers of artisan crystal from 1903-2004. CORNET MIT BLATT LOW BOWL. NEW NEVER USED IN ORIGINAL BOX. Importers of German, Czech, French, Polish, Irish etc for 80 years.